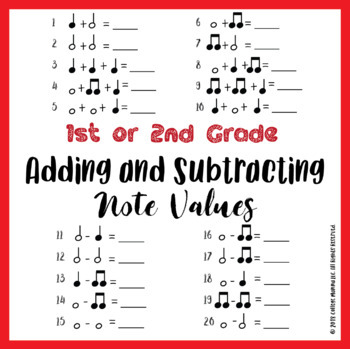 Get this fun-spin on musical note values with a splash of subtraction and addition. This is likely to get some big smiles from your students' first and second grade teachers! This worksheet has 21 questions. 10 addition, 10 subtraction, and one word problem. For ease of printing, there are three versions available to you, .PNG, .DOCX, and .PDF for both the worksheet and answer key. All files will be filed in a zipped folder. This is a good review for anytime of the year!